Bill Spaulding takes a break from clearing snow from his driveway to wait for the Bangor Public Works machine to battle its way through the massive snowbank, March 14, 2018. A big snowstorm will drop up to 20 inches of snow over most of Maine Saturday night into late Sunday. Bangor will see the season’s first significant snowstorm this weekend, and it could bury much of Maine under 2 feet of fresh powder. The storm is expected to start late Saturday night and last until well past dark Sunday night, dumping 12 to 24 inches of snow as it moves across eastern and northern Maine, according to Mal Walker, a meteorologist with the National Weather Service office in Caribou. Greater Bangor can expect nearly as much snow to fall this weekend than has fallen so far this season. Walker said 32.6 inches of snow have fallen over Bangor through Thursday, compared with Caribou where 78 inches have fallen. Walker said steady, moderate snowfall will start before midnight and create dangerous travel conditions as sustained winds of 15 to 20 mph and gusts as high as 40 mph accompany the snow. That will create near whiteout conditions and drifting snow at times, and Walker urged Mainers to avoid getting out on the roads during the duration of the storm. 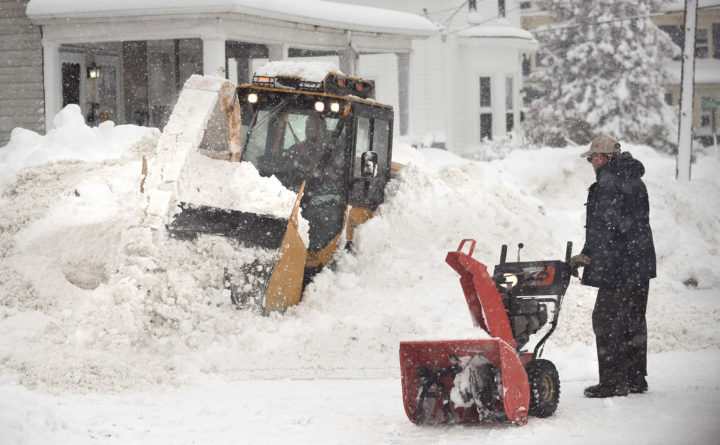 “Even with our experience with moving snow, this is going to be a difficult one,” Walker said. While the snow will begin to drop off late Sunday night, snow will continue to blow and drift into Monday morning as high winds whip across the state, according to Walker, likely creating rough conditions for the morning commute on Martin Luther King Jr. Day. Sleet and freezing rain is also expected along the Down East coast, Walker said. Meanwhile, the western mountains and northern Piscataquis and western Aroostook counties can expect to be less hard hit, with about a foot of new snow at most expected this weekend, according to Amanda Jellig, a meteorologist with CBS affiliate WGME. In southern Maine and along the midcoast, 6 or more inches are expected to fall from Portland up through Rockland and Belfast, according to the National Weather Service office in Gray. Those totals drop off inland toward Rangeley, Eustis and Jackman. The weekend storm will be preceded by a lesser round of snow on Friday, when only 1 to 2 inches are forecast to fall over Bangor and much of the state. That will be just a preview for the real event Saturday into Sunday.